Lucy. Wow. Where do I begin? A huge part of me was hoping I’d love the film just so I could start this review off by saying “I LOVE LUCY!” Kind of corny I know but that’s me. Anyways unfortunately I did not LOVE Lucy. I did like her a little though. Let me explain. 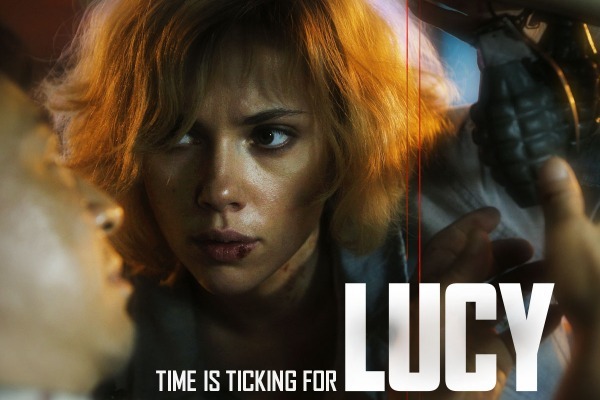 Lucy is a film that stars Scarlett Johansson, whom I do love, as a normal American college girl in Taiwan that ends up with superhuman abilities due to a series of unfortunate events. The main unfortunate event being that some drug bosses who have created a new drug called CPH4 kidnap her and implant the drug inside her stomach hoping to just use her as a drug mule. Everything changes when the drugs leak inside of her body enabling her to use more than the normal 10% of her brain capacity. After that Lucy must track down the other three drug mules in order to obtain and use the remaining CPH4 or she’ll die because of the side affects of the drug. Meanwhile the drug boss who planted the drugs inside of her is trying to kill her. As the CPH4 takes over her body she becomes more powerful and intelligent. At first Lucy must defeat her enemies with her new found physical capabilities but as her mental capabilities increase soon she can not only control herself in ways she never imagined but she can control others and their minds as well. This leads to a few clever yet kind of awkwardly funny “battles.” I use quotes around battles because knowing our hero knows all and has superhuman powers kind of makes any obstacle or villain obsolete and really kind of silly. Lucy however does need some assistance (for whatever reason) from the world’s biggest expert in the scientific field of using more than 10% of your brain. There’s a specific name for the field but that’s not important. The important thing is that expert is Professor Norman who is played by the never disappointing Morgan Freeman. Morgan Freeman adds stability and a calmness to a film whose lead is constantly evolving and changing beyond our understanding or anyone in the film’s understanding as well. On the surface this movie’s premise is very similar to “Limitless” which is a 2011 film starring Bradley Cooper. Underneath the surface is where this movie attempts to dig deeper than that film. However it is not always for the best results. For starters, Lucy uses a ton of random cutaways to animals in the wild and other randomness to further explain or show examples of the things characters (normally Morgan Freeman) discusses. The thing is we already get what everyone is saying and what is occurring in the film so jumping out of the present to go to a random scene of a gazelle getting chased by cheetahs completely slows down the film and is just annoying. It’s kind of like a film that has a narrator that only says things that you are already watching and understand. It’s completely pointless, a waste of time, and obvious filler. It’s also just goofy at times and downright frustrating when you just want to see the actual action that is taking place in your movie not some clips taken from a national geographic episode. The film is written and directed by the always unique Luc Besson and I must say this work is much better than the quickly forgotten BRICK MANSIONS that was released earlier this year. I also must commend him for making a film that actually says something and makes you think. The quality acting, which is carried by Scarlett, almost entirely make up for the film’s shortcomings. Scarlett and Morgan were casted perfectly and nailed their roles to perfection. Even Amr Waked, who plays a French policeman that assists Lucy, and drug boss Choi Min-sik who doesn’t speak one word of English the entire film did great in their roles! You may recognize Choi Min-sik and Amr Waked from their brilliant roles in Oldboy and Syriana respectively. Another great thing about the film was the special effects. In recent interviews Lesson has said he used more special effects in this movie than in any of his previous projects and it definitely pays off. The film is visually stunning. It’s fast paced and minus the pointless shots of animals in nature Lesson makes every moment feel urgent and important. Ultimately Lucy isn’t the Limitless meets The Matrix I had in mind when I saw the trailers but it isn’t a bad movie either. Although it fell short of my expectations, the cutaways of animal s annoyed me, and some of the story was awkwardly goofy at points or just didn’t make much sense (like the how drug Lord knew Lucy was superhuman but thought he could just chase her down and shoot her) through it all I was still entertained. Plus, anytime a movie is unpredictable and gives you visuals you’ve never seen before you have to give credit where credit is due. For that I give 3/5 likes. It’s a decent time killer if nothing else.